Last Friday morning, visitors and staff alike were treated to the sounds of music coming from, of all places, the Music Room, but at an unexpected time. 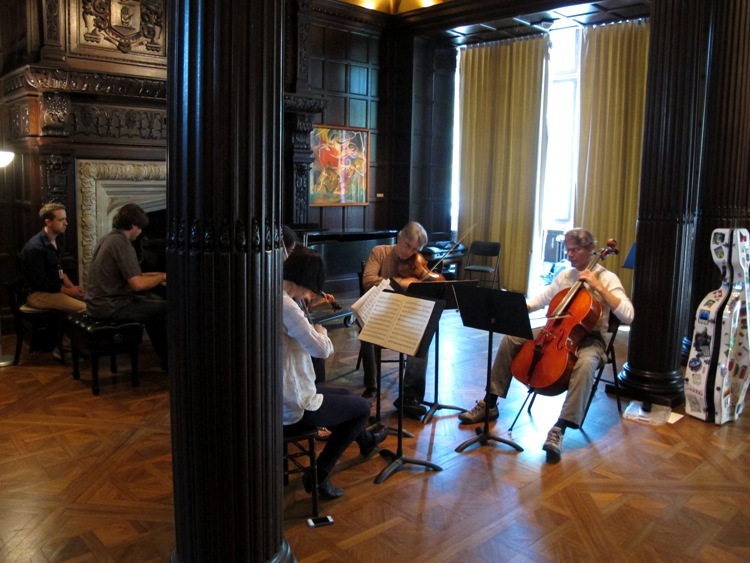 Members of The Phillips Camerata were rehearsing a Schumann piano quintet in preparation for their final concert of the season on May 27 at 4 pm. Pictured are Miranda Cuckson (violin), Olivia Hajioff (violin 2/viola), Marc Ramirez (violin 2/viola), David Teie (cello, and Edvinas Minkstimas (piano), with Music Researcher Jeremy Ney (seated to the left of the piano) . This entry was posted in Music Notes and tagged music, Music Room, Phillips Camerata, rehearsal. Bookmark the permalink. For you classical fans out there, Jeremy has let me know the piece being rehearsed was Schumann’s Piano Quintet in E-flat Major, Op. 44.